My second book is available from next week – 4th October 2017. 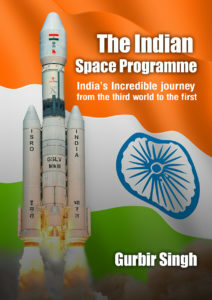 Almost 6 years in the making, it is a detailed account of India’s Space Programme. Available on Kindle and paperback from next week. The subject is not everyone’s cup of tea. If it is yours and fancy doing a book review. Drop me a note on info@astrotalkuk.org and I will email you a free copy. Overview of the book below and a bit more here. If Facebook is your thing then click https://www.facebook.com/TheIndianSpaceProgramme/. Overview: The story of the Indian space programme is described in 17 chapters, 600+ pages, 140+ illustrations, 8 appendices, 20+ tables and 1000+ endnotes. This book will be available from 4th October 2017 from Amazon. Ebook available for pre-order on Kindle Direct Publishing now and paperback from 4th October. More on the web and Facebook.